Home » A Lady and a Gallant. 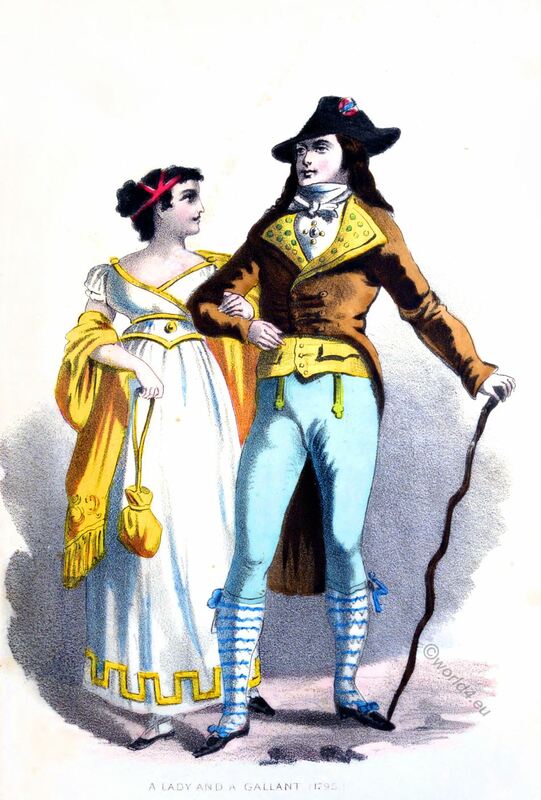 France Directoire 1795. A Lady and a Gallant. France 1795. THE most noticeable features in the costume of the gallant which the plate represents are the excessively high cravat, the variegated hose, the short waist of the coat, and the duplicate fob-chains. The extravagance of the costume in these particulars beyond that which is common to the time, together with the great length of the hair, gives the character something of a dandyish appearance. This effect is still further heightened by a striking contrast of colors. The lady, as represented in the plate, is more modestly and tastefully dressed, the costume bearing a slight resemblance to one of the styles now in vogue. These figures are taken from Albert Kretschmer.